This book explores residential satisfaction and housing policy trends in developing nations by using subsidised low-income housing examples in South Africa, Ghana and Nigeria as case studies. While there has been much documentation on the formation of residential satisfaction and the evolution of housing policy in developed nations, relatively little has been written about these topics in developing nations. 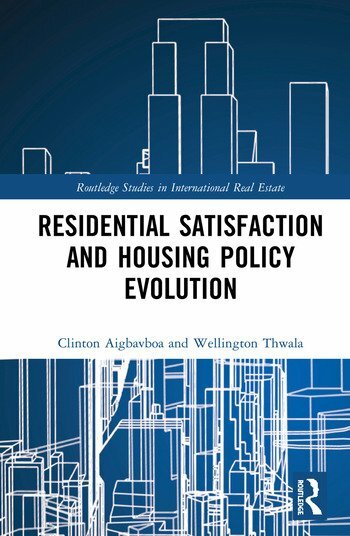 This book provides readers with two major practical insights: The first is focused on the theoretical underpinning of residential satisfaction and the formation of residential satisfaction in subsidised low-income housing through the development of a conceptual framework, while the second is focused on housing policy evolution and its trends in South Africa. In this section of the book, comparative overviews of public housing in two West African countries are provided with an emphasis on the philosophical basis for its development in these countries. The central aim of the book is to provide readers with ideas on residential satisfaction formation and housing policy trends in South Africa. Professor Clinton O. Aigbavboa is an Associate Professor in the Department of Construction Management and Quantity Surveying, University of Johannesburg, South Africa. Before entering academia, he was involved as quantity surveyor on several infrastructural projects, both in Nigeria and South Africa. He completed his Ph.D. in Engineering Management and has published several research papers in the area of housing, construction and engineering management, and research methodology for construction students. His research interest is situated in the fields of sustainable human development, with the focus on: sustainable housing regeneration (urban renewal and informal housing), Life Cycle Assessment in the Construction Industry, remanufacturing, leadership in low-income housing, Biomimicry, post-occupancy evaluation and green job creation. He has extensive knowledge in practice, research, training and teaching. He is currently the Vice Dean: Postgraduate Studies, Research and Innovation in the Faculty of Engineering and the Built Environment and the Head: Sustainable Human Settlement and Construction Research Centre, University of Johannesburg, South Africa. He is also an author of two research books that were published with Springer Nature and CRC Press. He is currently the editor of the Journal of Construction Project Management and Innovation (accredited by the DoHET) and has received national and international recognition in his field of research. The South Africa National Research Foundation rates him as a Young researcher with the potential of establishing himself within a five-year period. Professor Wellington Thwala, PhD, He is one of the researchers rated by the National Research Foundation (NRF). He is a Professor of Construction Project Management and Masters Programme Coordinator at the Department of Construction Management and Quantity Surveying, University of Johannesburg. Professor Thwala has varied research interests, which include project management, construction health and safety, engineering design management, economic and social infrastructure delivery, operations and production management and business competitive intelligence.